I gave the opening keynote at the C∘mp∘se :: Melbourne, and the organizers were kind enough to give me a lot of freedom in my choice of topic. I often find myself very frustrated by the way programmers talk about metaphor, so I chose a topic that would let me give an entirely different view of metaphors – metaphors the way linguists and cognitive scientists talk about them, metaphors as the crucial backbone of everyday thought and abstractions in mathematics and elsewhere. I drew from a lot of sources in preparing this talk; citations are given here where appropriate and a complete reference list is given at the end if you would like to read more. Given the breadth of the material covered in a 45-minute talk, I had to breeze through some of it; perhaps next time I return to Australia I can explore some topics in more depth, such as how our search for closure (in mathematics) has been an important motivation for developing more and more kinds of numbers. At any rate, I hope for now, this will give an overview, enough that the conversation about metaphors might shift just a bit and we might find new ways to empathize with learners who are struggling to see the abstractions. You can watch the talk here or keep reading below. Or both! Which one doesn’t belong here? The top right is the only quadrilateral. The lower right is the only one with curved lines. The lower left is the only one that is not a closed figure. The top left is the only one that is an actual triangle. You might be able to come up with more reasons why any of the four doesn’t belong. 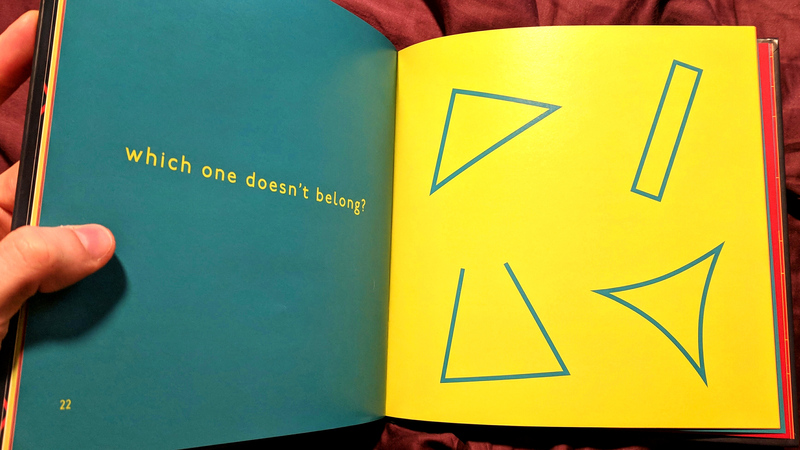 We can see in three of the four figures some notion of “triangularity”; usually even children who have yet to learn a formal definition of a triangle can see it. Triangularity is a notion we came up with and then formalized by looking around at the irregular and somewhat noisy input from the real world and deciding on ways to group things according to their properties. Kids will often ask, and so should you: What properties matter when we talk about these things? In some contexts, the properties that matter are very obvious. 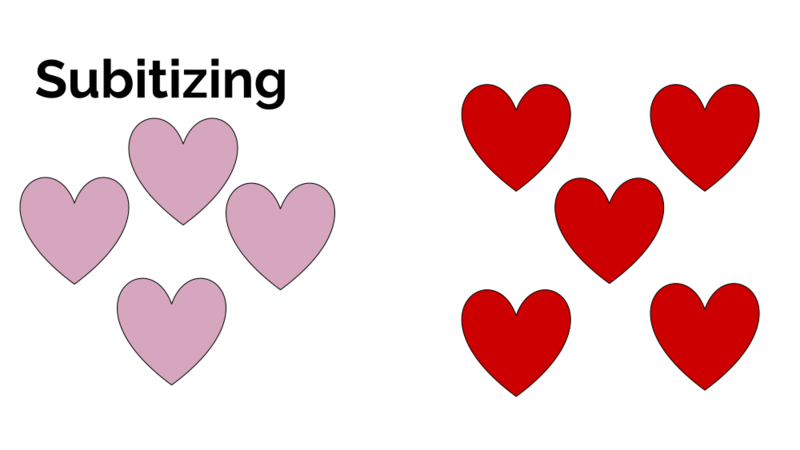 In the image above, if we are in a context where what we care about is color or size, for example, then we can easily pick out which one doesn’t fit the others along those criteria. But the answer isn’t always so obvious. Now which one doesn’t belong? 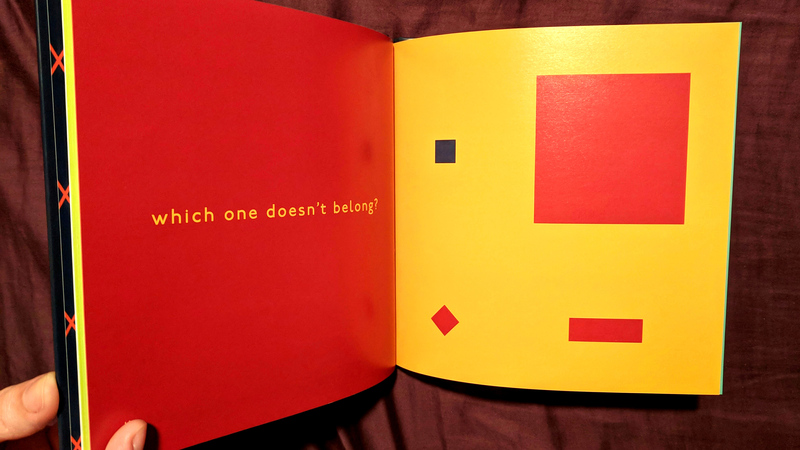 Like the images from the book, there isn’t a single right answer. You can make an argument that each one in turn doesn’t belong: the top right because it’s the only product, the bottom right because it doesn’t involve numbers at all or is the only one dealing with a two-valued set, the bottom left because it’s the only one that involves a collection of things or a type constructor (in Haskell terms), the top left because it’s the only one that doesn’t have a sensible notion of an identity value or the one that is most purely identifiable as an operation of “choosing”. 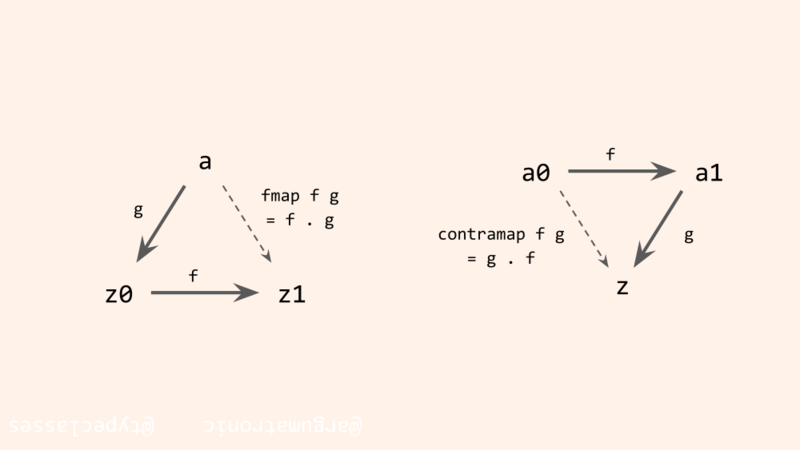 The mappend operator is the Semigroup operator. So, we can see each of these operations as being different from all the rest, as we saw in the previous slide, but we can also group them all under the notion of semigroup. A semigroup is a set along with a binary associative operation (such as min, ||, ++, or *) that obeys some laws; you can also think of it as a monoid minus the identity element. We use newtype wrappers (Min, Product, and Any) to indicate which semigroup because many types form semigroups under multiple operations; we use one operator for all these in Haskell, but indicate which operation is relevant by renaming the underlying type (e.g., Integer or Bool). The point is, depending on how we look at these equations and what properties matter to us at a given time, we can see them each as being different or see them as all the same. They are different, and yet they are also the same at some level of abstraction. Abstraction looks at the ways things are the same and ignores ways in which they are different. Abstraction allows us to formalize things and make sure they are all very proper and law-abiding, and it also sometimes provides us new layers of what we can consider “concrete” in order to abstract and generalize further, as we’ll see. This process relies on our ability to analogize, and, more importantly, on metaphor. Analogy and metaphor are not quite the same thing, but they both come under suspicion from programmers who like to believe themselves rational folks who value clear, precise statements of what a thing is not what it’s like. So you see a lot of statements like this one in this business. This was taken from a paper about designing interfaces, but I don’t want to particularly call out or shame this author, because this is an extremely common view of metaphor. But I’m here to tell you that without metaphors, mathematics and computers simply wouldn’t exist. “The Idea of Order at Key West” has always been my favorite poem, and the poet here hits the nail on the head. The ocean, and indeed the world, makes noise; we make order – we humans make music from the noise of the physical world. It’s become clear in the past few decades that we come into the world with some innate abilities for dealing with the raw inputs we begin responding to even before birth. 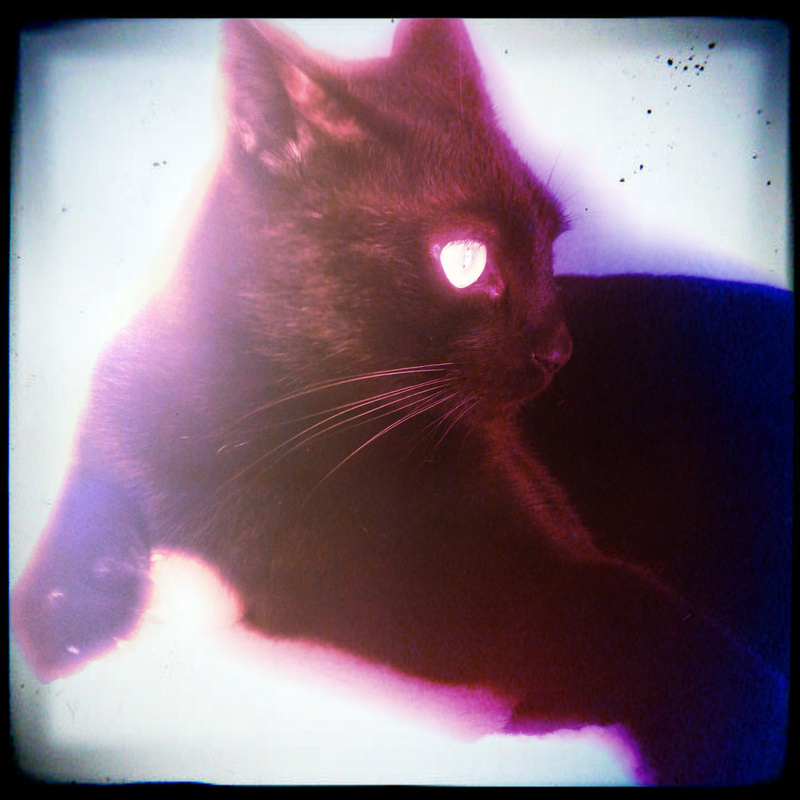 We share some of these with animals, and it’s clear that they are evolved aspects of our embodied minds. The case for an innate grammar of one kind of another is complex and really out of the scope of this talk; I refer you to Ray Jackendoff’s Patterns in the Mind for a readable, mostly nontechnical overview of the arguments and evidence. But if you’ve ever tried to listen to rapid natural speech of native speakers in a language you do not speak at all, you have some sense of how hard it is to even discern word boundaries, yet babies couldn’t learn language if they were unable to do this. Further research indicates that we have some innate arithmetic ability. For example, we (and some animals) seem able to accurately gauge how many objects are in a collection without counting them; when we’re infants we can perhaps do this for collections up to about three objects, but this increases as we get older, up to about seven objects for most people. This ability is known as subitizing. Babies (and, again, some animals) also seem to understand addition and subtraction up to about three; for details about the relevant research, I’ll refer you to George Lakoff and Rafael Nuñez’s Where Mathematics Comes From. And finally there is significant evidence that we have innate abilities to analogize and thence make metaphors. Here, I’ll refer you to Douglas Hofstadter’s book Surfaces and Essences as well as nearly any book with George Lakoff as one of the authors. Let’s cover a couple of these in more depth. If I ask you how many red hearts are here, you do not have to count them. Very young children might, but adults can easily subitize this, especially when they are put in a familiar pattern such as this. Greg Tang writes math books for children specifically encouraging this subitizing ability; the abacus is also designed around this principle, as are dice, the patterns on playing cards and dominoes, and the ways we group the zeroes by threes in large numbers. Analogy is what allows categorization to happen. Analogy is the perception of common essence between two things. I mentioned that there is some difference between analogy and metaphor. Analogy is the similarity between two things. Metaphor is the linguistic expression of this similarity but, more fundamentally, metaphor is when we structure our understanding of one thing – usually something abstract or at least not something we can directly experience through the senses – in terms of another. 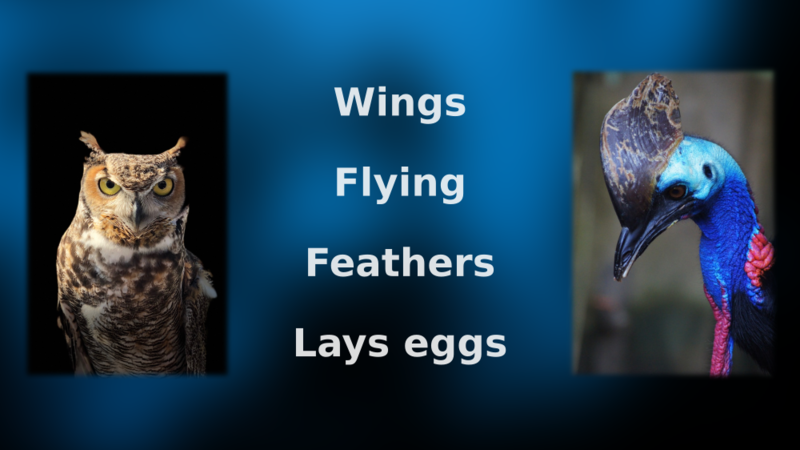 Analogy is what lets us see this friendly owl and this vicious killer and pay attention to what they have in common: they are winged, they have feathers, they lay eggs. In this case, one of these can’t even fly, although most winged and feathered creatures can! We then organize all the data the world provides about winged, feathered, egg-laying, usually flying creatures into a group and call it BIRD. 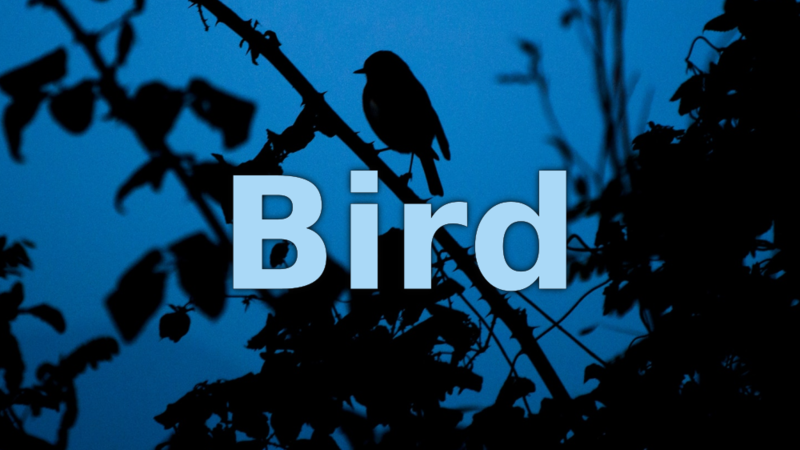 Bird is now a category of thing that exists in your mind and in your mental lexicon of your language. 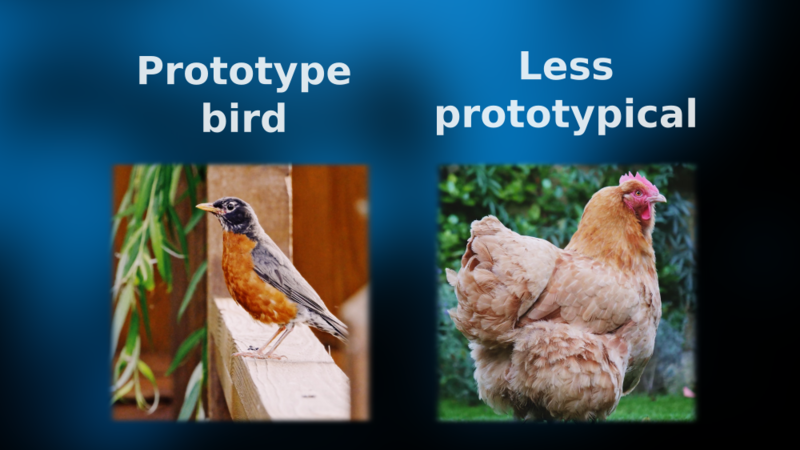 Some birds are more prototypical birds, some are less. Generally the more “bird-like” features the bird has, the more prototypical it is and the more likely you are to think of it on one of those tests they give you where they ask you to name the first instance of a category that comes to mind. Chickens are less prototypical than robins, penguins are even less prototypical, and the Australian velociraptor from the earlier slide even less so (for most people). Analogy and being able to find the essence of things and organize them accordingly is, indeed, the core of our cognition. 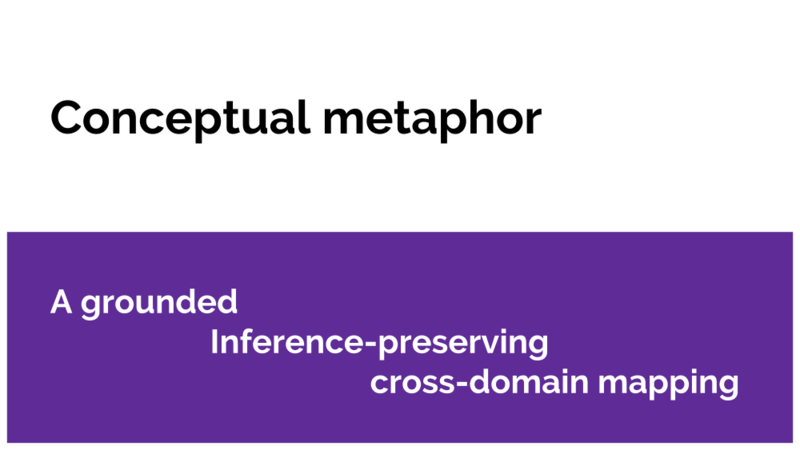 The word “metaphor” is often used to refer to the mere linguistic expression of analogy; however, over the past few decades, linguists and cognitive scientists have come to realize metaphor is much more. Conceptual metaphor is how we structure our understanding of nearly everything we can’t directly experience. For example, we structure our understanding of time in terms of spatial relationships. We think of times as being “ahead” or “behind” us, as if we were standing on a physical timeline. 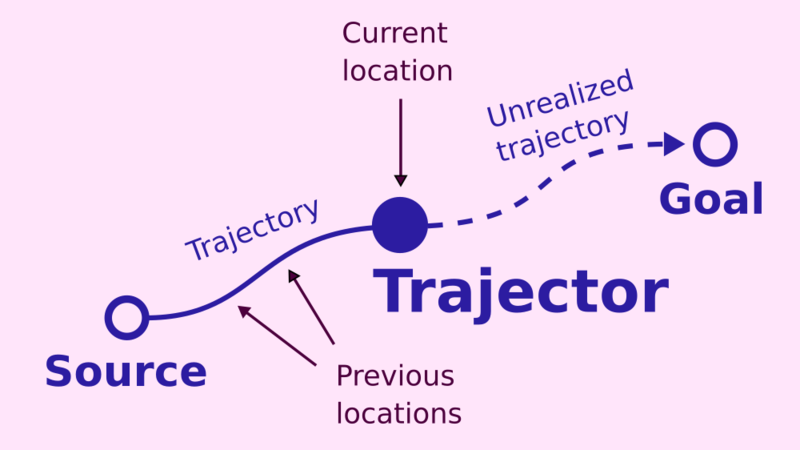 One interesting thing here is that, while structuring understanding of time in terms of space is universal, the orientation is not universal: in some cultures, the future is “ahead” and in some it is “behind”. An important thing to understand is that the inferences about what it means for something to be “ahead” of you versus “behind” you hold for those cultures’ interpretations of time, mapped directly from the spatial inferences. We’re going to get a little hand-wavy here, mostly to stay out of the weeds of technical detail and the various areas that are still poorly understood and up for dispute, but we can think of conceptual metaphor in the brain as something like this. We have a group of neurons that are interconnected and correspond to a concrete concept such as UP. Up-ness is a well understood, universal, concrete notion that we understand by being bodies in the world. So we have this little network of neurons related to that concept. On the right we have the target frame, the thing we’re trying to understand, to grapple with, to talk about. 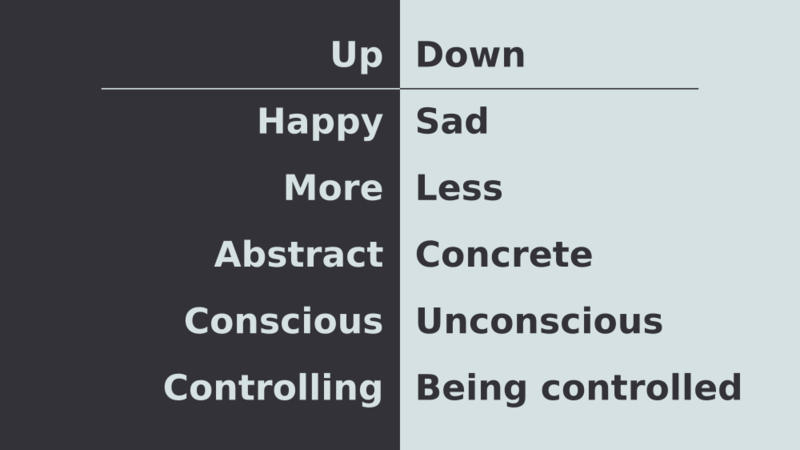 Over time as we experience some target concept, such as “more” or “happy”, and analogize aspects of the source concept UP to aspects of the target, we form connections between “happy” and “up (physical)”. The little neural network for “happy” has most of the same structure as the network for “up” (although over time it might gain mappings from some other source, some other concept that we use to partially structure the concept of “happy”). And so the concept of HAPPY becomes irrevocably structured in terms of UP. This does find expression in our language, and it’s important to note that once we have this metaphor, poets might get creative about ways to express it, but the metaphor never breaks – HAPPY is never down. This is how George Lakoff defines conceptual metaphor. By “grounded” we mean there is a source frame, generally something more concrete or better understood. By “inference preserving” we mean that the inferences we can make about the source concept hold for the target concept. So when we structure some concept in terms of UP-DOWN the continuum of relative up-ness and down-ness will hold for that concept as it does for the physical relationship. But the spatial continuum represented by UP-DOWN is everywhere. It’s one of the most fundamental concepts we have, and so we structure so many things in these terms. Quantity is slightly less concrete than spatial relationships; consciousness is a lot less concrete. But we can imagine how each of those mappings might have come about: as the quantity of something in a container becomes “more” it also “rises”; unconscious animals are not typically upright. 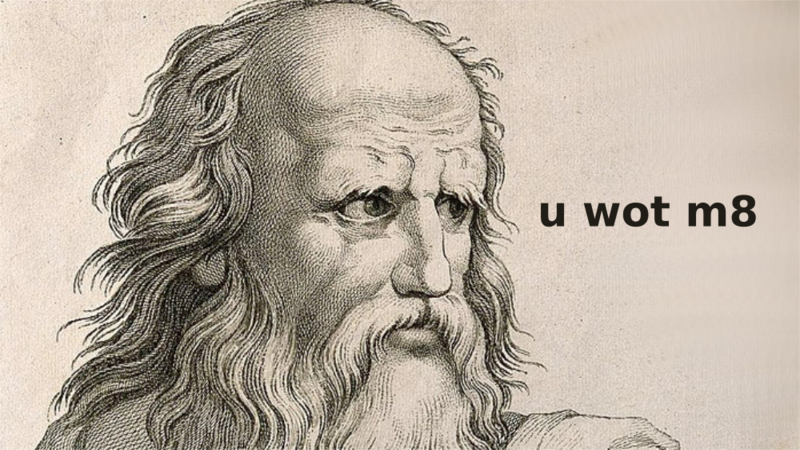 Things like “rational” and “virtuous” mapping to UP may result from an extension process: conscious is up, humans are more conscious than other animals therefore the more human attributes, such as reason and virtue, are more up. To a certain extent, we’re telling “just so” stories here about how these things come about, but we are certain that the mappings exist, however they came to be. They show up consistently in our language usage, are extremely common cross-culturally, and are further revealed as physically real in our brains by the various methods of the cognitive scientist. Importantly, these relationships also preserve the inferences of their mappings. Your mood can be raised and lifted; even if you are already happy, your spirits can be further lifted and you may become joyful or even elated (whose root means “raised”). And if you get depressed enough, you may reach a nadir. One thing I like to do sometimes is think of how we can do things like “more concrete” and think of the state of “being concrete” increasing. Even though “concrete” is down relative to “abstract”, we can prioritize the up-ness of the quantity relationship, if we were going to draw a visualization of “more vs less concrete”. Think about it. Seriously stuff like this has kept me awake nights. OK but what does this have to do with mathematics?!?! I’m referencing mathematics in my title and it’s hard to see how we get from birds and happiness to the serious stuff of mathematics, right? Let’s go. Mathematics starts from a variety of human activities, disentangles from them a number of notions which are generic and not arbitrary, then formalizes these notions and their manifold interrelations. We’ll take our starting cue from a man who surely understood abstraction and precision, Saunders Mac Lane, one of the inventors of category theory. He found himself frustrated at the poor state of philosophy of mathematics and tried to explain why in this paper, eventually expanding it into a book called Mathematics Form and Function. What he saw was that none of the dominant schools of thought adequately explained mathematics. Mathematics starts off in concrete activities, aided by our innate abilities (see above), “disentangles from them a number of notions which are generic and not arbitrary”, and then formalizes and makes precise those notions (and their “manifold interrelations”). This disentangling is the process of settling on things like “triangularity”, “semigroup”, “bird” by picking out properties that matter. We, even advanced mathematicians, often discover which properties matter by process of experimentation, trial and error. We think, well, what if this property mattered? And see where it leads us. If it doesn’t lead to anything useful we can generalize, whether to understand the world better or to find new planes of abstraction and new relationships, we abandon it. You can see this process happen naturally in children if you let them go through it, but mathematicians like Mac Lane, William Thurston, and Eugenia Cheng sometimes describe working through similar processes. Now we’ll look in more detail how it happens for math. 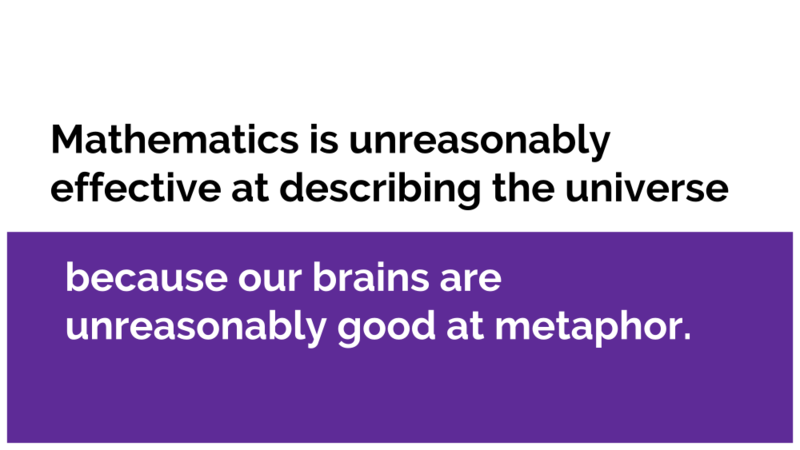 Mathematical metaphors come in basically three types. Grounding metaphors are those that ground abstract concepts in some human activity. There are a handful of grounding metaphors for mathematics. Mac Lane gives more than Lakoff and Nuñez do, and we’ll stick with their characterization for our purposes. 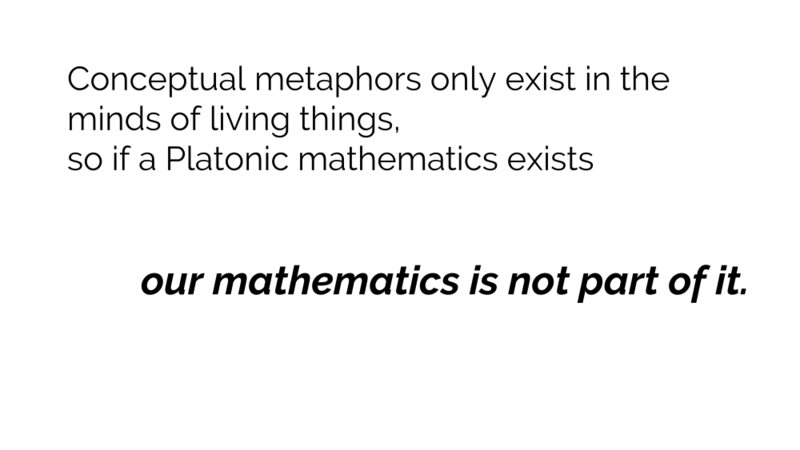 Linking metaphors link two areas of mathematics (or some other field, but our concern is maths) by analogy with each other. 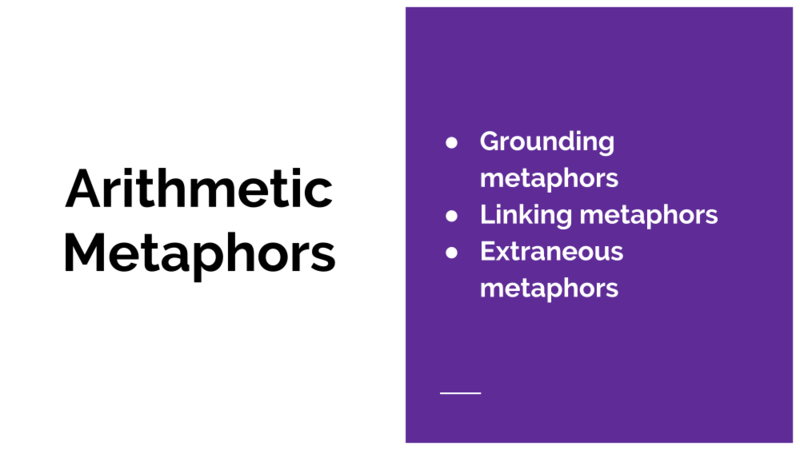 The last one, extraneous metaphors are things like “maybe monads are like burritos”; typically when we think of metaphor as a poetic device, it’s the extraneous metaphors we’re thinking of. Extraneous metaphors can be useful sometimes for explanation of new concepts, but they are not integral to how the concepts came to be in the first place; the development of monads in category theory didn’t have anything to do with burritos (arguably it had something to do with containers, but not in the way programmers typically mean that). Object collections: This is often one of the first ways we work with kids to teach them arithmetic. You have a group of three candies and a group of two candies (note that both of those collections can be subitized rather than counted) – now look we have a group of five! You can count them! Every time it will be five, and you can subtract the one from the other and have the two collections you started with! This metaphor does not lend itself well to a notion of zero (a collection of zero is … not a collection, not at this concrete level) and certainly not to negative numbers. It also becomes difficult to do with large numbers, although some math manipulatives have bars of 10 and blocks of ten 10s for a “hundred block” that helps with subitizing arithmetic. 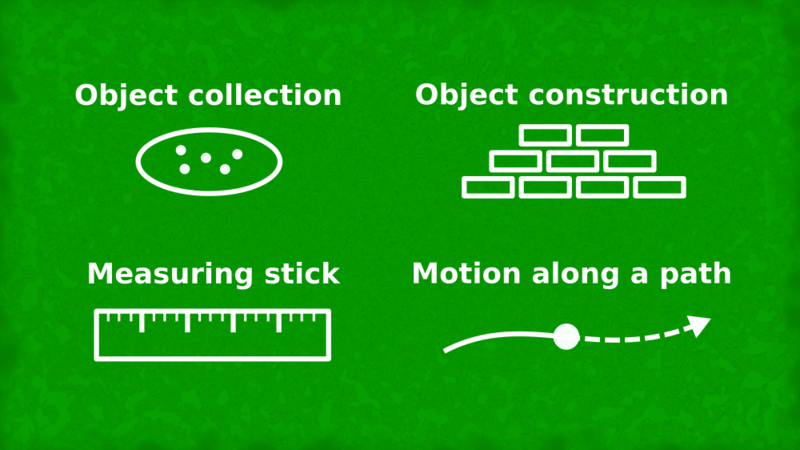 Object construction: A next step is thinking of numbers as constructed objects rather than collections. We can think of a single object being built out of parts, like you might build a single figure out of Lego bricks. We can see the figure get bigger; we can see that a single object made of five objects consists of five single bricks or of a group of two bricks plus three bricks. We can get to fractions from here, among other things (such as literal cake cutting). 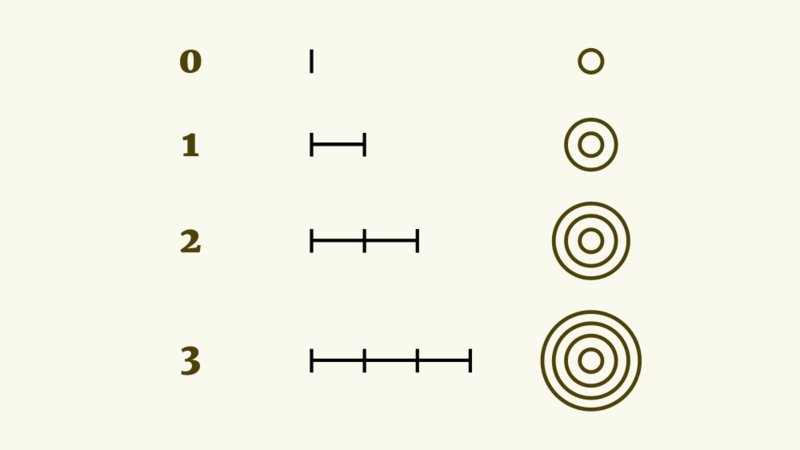 Notice in both of these metaphors, numbers are related to multidimensional tactile objects. Measuring stick: Measuring is also a natural human activity, whether we’re doing it with a body part such as a “foot” or with a stick or formalized stick. 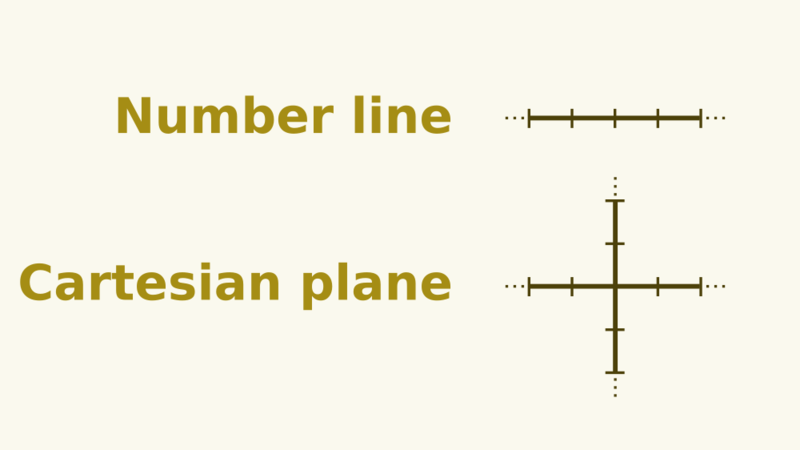 Now numbers can be seen as one-dimensional segments or points on a line. This notion gives us a very clear way to conceptualize zero, as the starting point of our measurement. 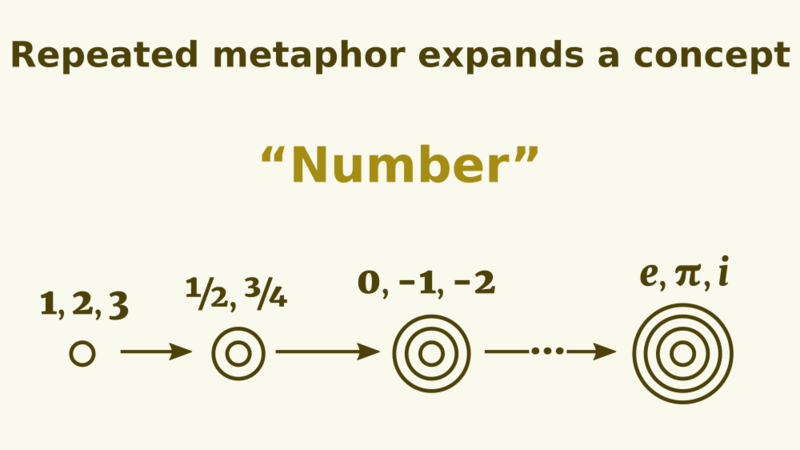 With these two metaphors, especially measuring things, we start to get ideas about irrational numbers. If we already understand the Pythagorean theorem as a result of measuring triangles and formalizing those properties, then at some point we encounter a triangle whose hypotenuse is √2. And we have this metaphor that any line segment corresponds to a number, so √2 must be a number now. The combination of these four metaphors give us a lot to work with – numbers as multidimensional tactile objects, numbers as spatial relationships, and so on. However, doing arithmetic physically with one of these source frames behaves the same as arithmetic in any of the others. If you put a collection of two objects together and a collection of three together, you get five; if you take two steps along a path and then take three more, you have taken five steps. From here, we formalize and make precise the laws of arithmetic. Let’s look at the source frame motion along a path in a little more detail. This is closely related to the measuring stick idea, but it includes the most natural source of a “zero” point of any of the metaphors – the start of the path. Moving along a path also includes the idea of having many points between any two points, as well as the idea that we might extend a path indefinitely. We might also return to the start and go the other direction, so there are points that are in some sense “opposite” the points on the original path – the negative numbers. Furthermore, if you have traveled from the start point to some point A, then you have been at every point between the two points, and this inference is preserved when we map the idea to the number line. Do these look familiar? These diagrams of function composition show motion along a path and rely on our intuitions about real paths (at least, “as the crow flies” or idealized paths) to demonstrate an important property of composition. If you have a path from A to B and a path from B to C, then you have a path from A to C, although you might not have a direct path (it might literally be a path that goes from A to B and then to C). So, what are numbers? We just don’t know. There isn’t a single answer; what a number is depends on what branch of mathematics we’re talking about and what we want to do with it. We have numbers that violate certain properties we expect numbers to have. How did we end up here and how are all they all numbers? We ended up here in part because we have two basic “shapes” of numbers – as points or segments along some kind of line and as potentially three-dimensional collections or groups or … sets of matter. These concepts are qualitatively different; they are different in kind. And yet we can also identify and formalize ways in which they behave the same or ways in which they are isomorphic to one another even if they are not the same. 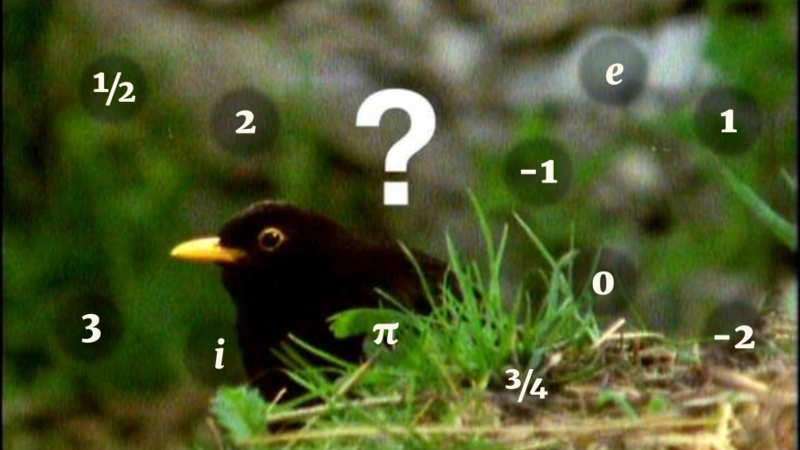 To ask how 3 and 3 :: Float and π are all easily thought of as numbers is to ask the same question as how sparrows and penguins and emus are all birds. They don’t all have all the properties of birdness, but they have enough of them. 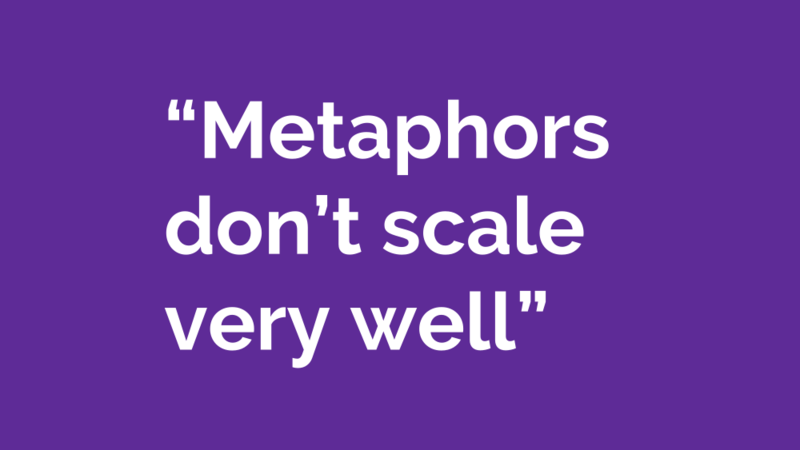 We extend all our metaphors. Once we have conceptualized something in terms of another thing, we can extend that conceptualization. So if we can lay out a horizontal number line, then, sure, why not? We can also have a vertical one that crosses it at the zero point. Now, among other things, we can conceptualize numbers as points in two-dimensional space. Set-theoretic ways of constructing numbers can also be extended in various ways. Again, these are different in kind and useful for different types of mathematics. We have structured the abstract concept number in terms of two different types of grounding concepts and thus created a very complex target concept. As Aristotle said in the Rhetoric, “Ordinary words convey only what we know already; it is from metaphor that we can best get hold of something fresh.” I’m not certain we quite have a hold of what a number is yet, but we have done well without having a single absolute answer. By repeated application of analogy and linking metaphor, we are perfectly able to conceive of all these things as numbers. I want to say just a brief bit about closure here. Part of the reason why we continually link new concepts to the concept of a number is we have an intuition from the real world that arithmetic operations in general should be closed – that is, that they should return an entity of the same kind as their inputs. When we add two collections of objects, we get another collection; when we walk two sections of a path, we have a path. But as we expanded our conceptions of numbers to include irrational numbers and negative numbers, some operations were no longer closed. By considering whatever entity those operations did return as another “number” – no matter how irrational, no matter how much it didn’t look like other numbers – by expanding the set of numbers, we are able to preserve closure. But incidentally, now that we have this concept of number, and all the ways we understand numbers are by analogy to things in the world, we decide – via metaphor again – that NUMBERS ARE REAL THINGS. The real things are real; quantities and points along a path are all things we understand intuitively from our experience in the world. But numbers, like language, are not things that exist independent of our minds. This is one of the things Mac Lane argues against in his philosophy of mathematics, but many mathematicians believe in the Platonic existence of numbers that we discovered rather than invented. Well, as with natural language, it’s a bit of a false dichotomy: we discover properties of the real world and we invent formalizations and idealizations of them. In turn, we may discover new links between them and thus invent new branches of mathematics, new categories. Next we’ll look more at the idea of linking metaphors. We’ll start first with one of the grounding metaphors of our concepts of sets. 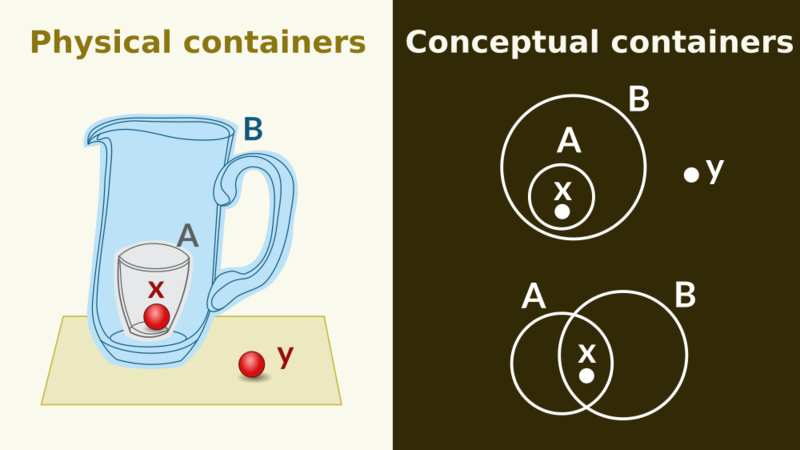 Once we conceptualize the idea of container, we can visualize (mentally or on paper) situations that we are extremely unlikely to see in real life by analogy with ones that we do. In the container inside the pitcher, it’s very clear that the object inside the container is also inside the pitcher. And if we make that a two-dimensional drawing of the same idea, we transfer that intuition easily. But the situation in the bottom diagram is probably not something we’ve experienced in the real world, and it doesn’t need to be as long as we can draw it. The drawing is something we can experience through our senses and linked back to the “real” containers via metaphor. Now we have a folk conception of set theory and Boolean logic. 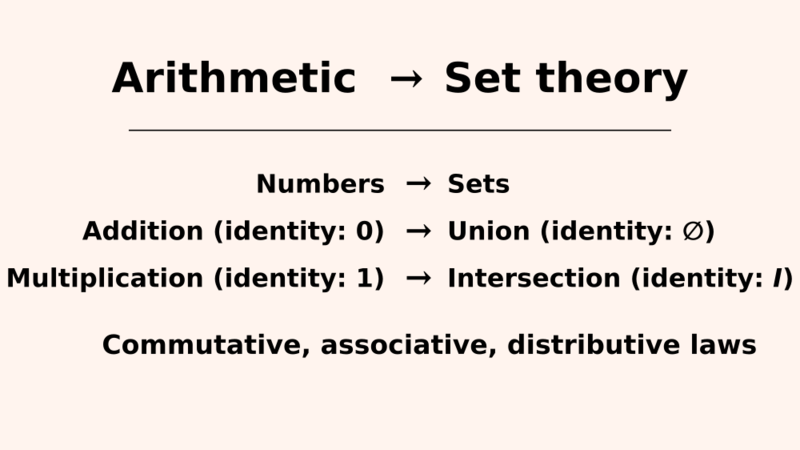 We initially rely on our intuitions about containers to talk about sets and build up set theory, and then formalize certain properties and make them precise. 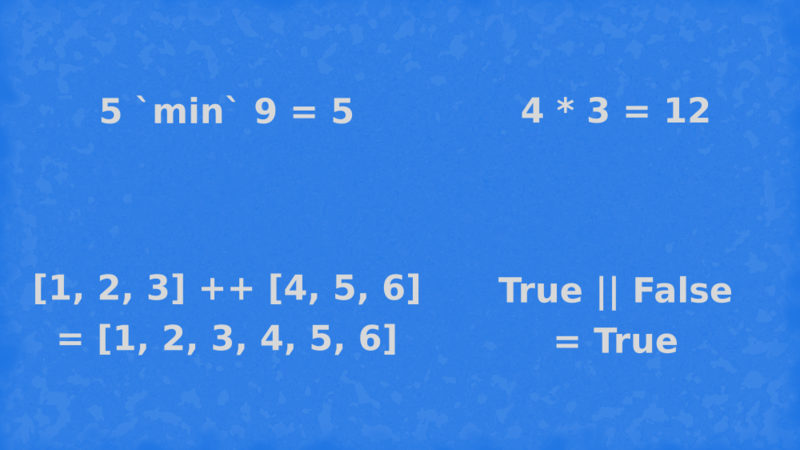 Once we have, we notice that many set operations behave the same as arithmetic with integers. We can link them analogically. George Boole came along and decided we could also conceptualize propositional logic in terms of arithmetic, from which we could link all three areas of mathematics. In doing so, Boole paved the way for Claude Shannon to provide us a new concrete grounding for understanding logical operations: circuits. Anyway, linking three already abstract concepts (more abstract than the original grounding metaphors of arithmetic, anyway) gave us a new abstraction. The concept monoid arose from the pattern of similarities among arithmetic, Boolean arithmetic, and set operations. Set theory, arithmetic, and Boolean logic are not concrete enough to constitute sources of grounding metaphors in Lakoff and Nuñez’s terms, and yet they are less abstract than the concept monoid. 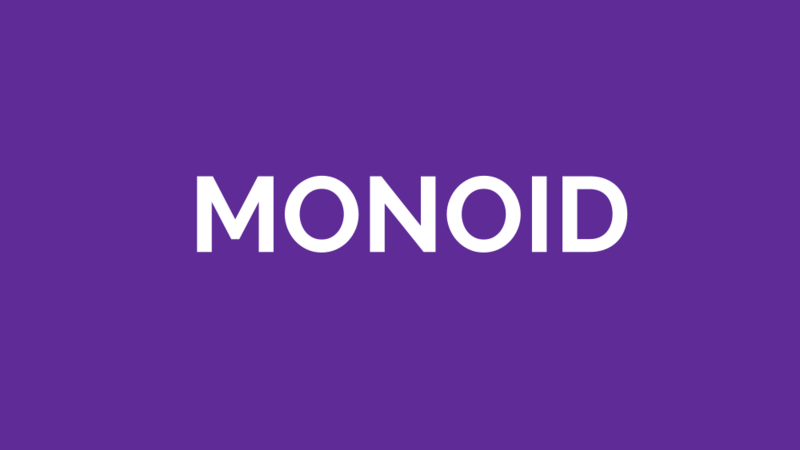 Creating that new word, that new concept, via metaphor, and then formalizing it allows us to structure entirely new experiences and concepts in terms of our understanding of what monoids are in general and how they should behave. 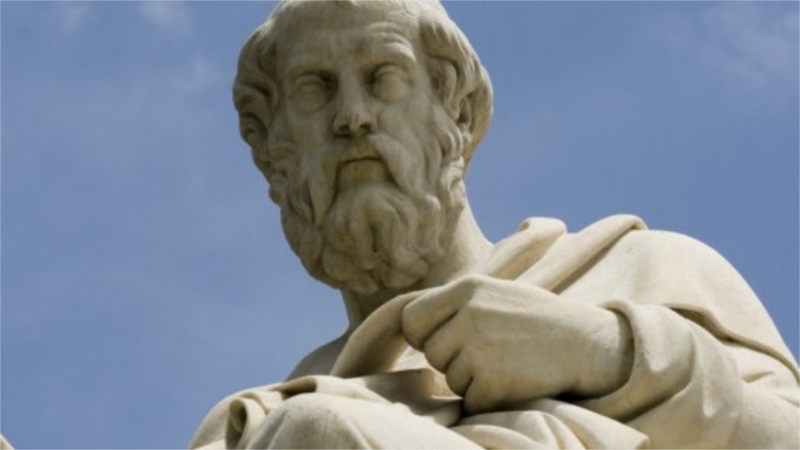 Like all the Western world, I have lived in the shadow of Plato, but new research is constantly emerging that this is the source of all mathematics – indeed, something like this process appears to be the engine of most human thought. Does this mean mathematics isn’t true or real? Certainly not. There is a notion developed independently (I believe) by several thinkers that we may call conjectivity or intersubjectivity to play off the historical dichotomy of objective-subjective. Subjective truth is wholly specific to the subject, the person thinking the thoughts or experiencing the stimulus. Objective truth is totally independent of the human mind and is true whether or not it is known or knowable by any human mind. Historically, the pendulum has swung between these two poles and there has been tension between them. 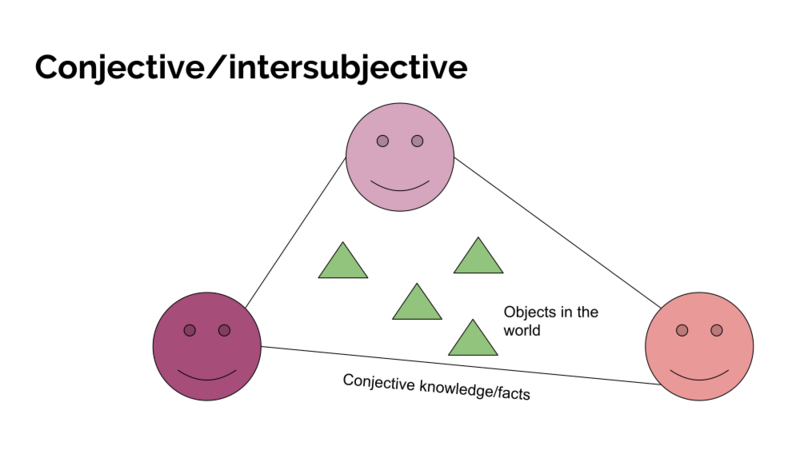 The notion of conjectivity (Deirdre McCloskey’s word) or intersubjectivity (Habermas’s word), or “institutional facts” as I believe John Searle calls them, says some knowledge is not quite subjective and not quite objective. There are some things that cannot exist independently of the human mind and yet we can still make statements about and judge these statements true or false independently of any particular subjective mind. Human language is one such thing. Language does not exist outside of an embodied mind; it is not an objective fact about the world outside of the mind. Yet there are statements we can make about it whose truth value does not depend on the interpretation of any one particular mind. Money is another such thing; we invented money, it would not exist without us, and yet there are things we can say about it whose truth value is independent of any particular subject. I believe mathematics is another such thing. It is clearly related to what we really experience as physical bodies in the world. As evolved, embodied minds experiencing certain aspects of the world in similar ways across all human cultures, there is something like objective reality to what we experience, and our brains seem to have evolved to pick out the same sorts of properties as important and make the same varieties of analogies. We make discoveries in this world and we invent formalizations and words for those properties, and those give us a springboard to discover new analogies. And so on. A mathematics based on conceptual metaphor, like language, is a product of our minds, not of some reality external to us. Numbers and shapes and infinity are not literally existing objects in a realm of pure forms. Thus, if that realm exists, and you may still believe in it as one believes in a god, our mathematics is not part of it. Finally, we’ll pay very brief attention to extraneous metaphors. You might be familiar with some. 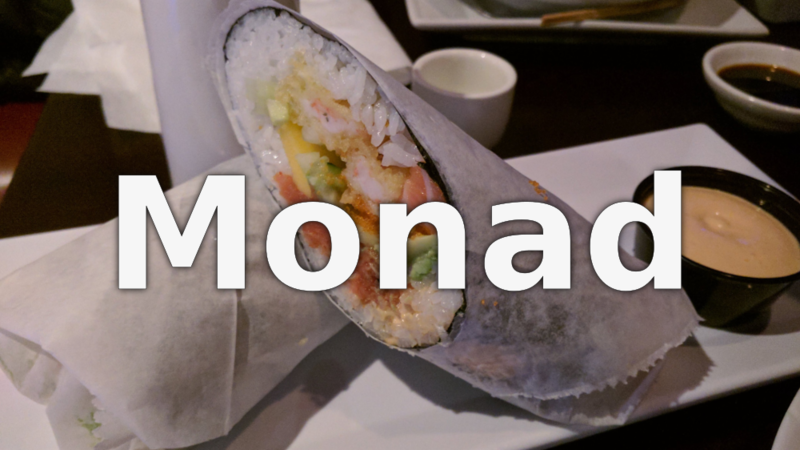 If a monad is a burrito, is a sushi burrito a monad transformer? 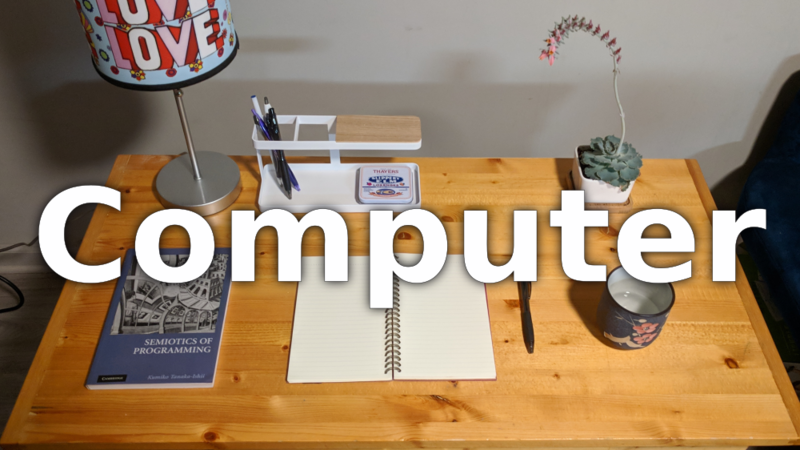 Do you interact with a computer like you do your static desktop? People like Brenda Laurel, Seymour Papert, and Bret Victor would very much like to reimagine computer interfaces through different metaphors, but they will be metaphors nonetheless. Still, these are extraneous to the development of mathematics and programming. 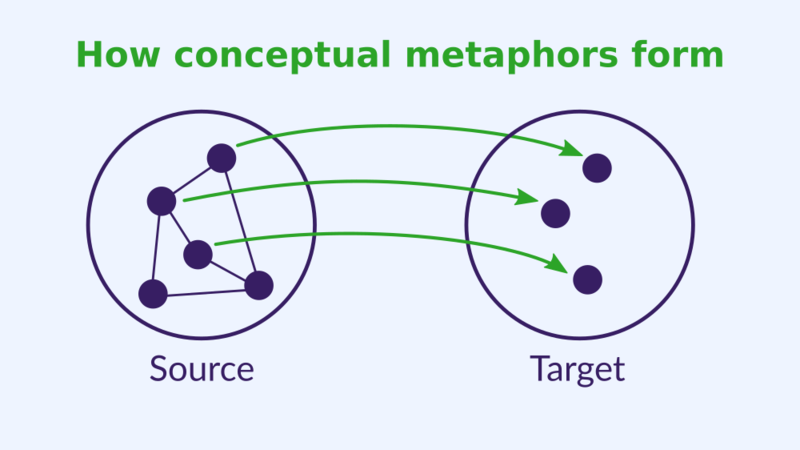 Such metaphors may be useful in certain contexts, perhaps more or less depending on how many aspects of the source map to the target. 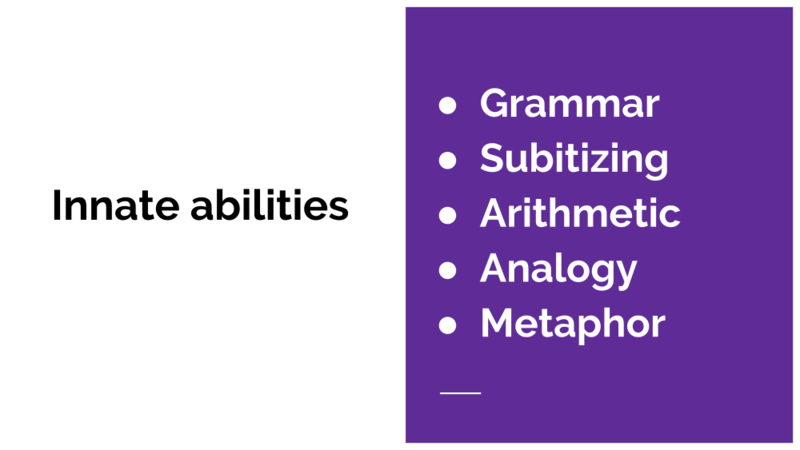 Teaching without these extraneous metaphors can depend, instead, on building up intuitions in the same ways that these were originally invented. I’ve quoted this in several talks, but one of Chris Martin’s math teachers, Jean Bellissard, said, “It’s a succession of trivialities. The problem with mathematics is the accumulation of trivialities.” Well, in this view, for teaching, it’s the accumulation of layers of metaphors, each of them pretty understandable by itself, but at any point if you fail to make one analogical leap, you might get lost forever. Well, not forever, math will always welcome you back, but for a while. So, in summary, mathematics is unreasonably effective in the natural sciences, because our brains are embodied in the natural world and we are unreasonably good at finding (and formalizing) the properties that matter.